Preet, a high net worth financial planner (and former race car driver), is back again! This time, instead of explaining the basics of call options, he shows us a risk reducing options strategy called The Equity Collar. If you are interested in reading more about Preet, you can visit him on his blog WhereDoesAllMyMoneyGo. 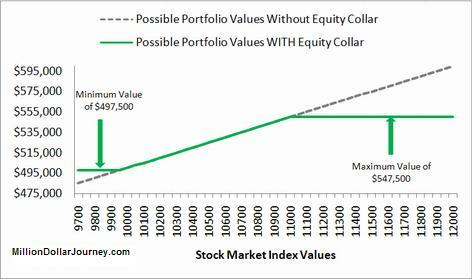 I had the opportunity to write about the basics of call options for Million Dollar Journey a few months back and thought I would continue on that theme by presenting a common option strategy known as the "Equity Collar". 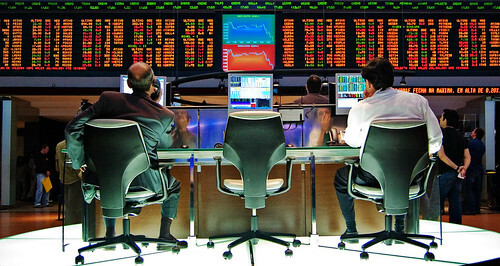 Speculation and Hedging are the two main reasons for using derivatives. Speculation is the taking on of risk, and Hedging is the reduction of risk. Within both broad categories, there are varying degrees of each. The Equity Collar is very much a hedging strategy designed to reduce risk. Perhaps as a means to facilitate understanding I will start with an investor profile and then work in the strategy as a solution to her problem. Let's say that Sally is 64 years old and has accumulated a sizeable portfolio that is strictly invested in an ETF that tracks the entire stock market (collars work with individual stocks too though). Let's say that this stock market is trading at 10,000 right now and the ETF's unit value is $100. The markets have pulled back recently, and Sally is unsure if we have hit bottom or if there is more downside to the markets. She would like to retire at the end of this year (9 months from now) at which point she has decided she will then switch her portfolio to 50% equities and 50% fixed income. She owns 5000 units of the ETF for a total portfolio value of $500,000. She feels strongly that with the recent pull-back in the markets that if we are at a bottom, the market will have a positive year and end up at maybe 10,800 points, or up 8%. At the same time, she realizes that in the short term the markets can pull back further and doesn't want to erode her retirement savings any further if that were to happen as she is 9 months away from retirement as mentioned. If she wanted to protect her portfolio (or insure it from further losses) she could buy a put option on the ETF with a strike price of $100. This put option gives Sally the right (but not the obligation) to sell her ETF shares at the strike price of $100/unit up until the option contract expires. This now protects her from losses in her portfolio up until the expiry date of the option (which in her case would be 9 months from now). So for example, at the end of the year if the market had dropped from 10,000 down to 9,200 (a loss of 8%), her ETF units will have similarly dropped from $100/unit to $92/unit. However, Sally could exercise her right to sell her units for $100/unit. Therefore she protected her portfolio from loss. Of course, as with any insurance there is a cost involved which I have omitted up to this point. Let's assume that the cost of the put options are $2/share to purchase. In this case, to completely protect her portfolio she would need to buy 50 put option contracts (an option contract is for 100 shares) to insure her entire $500,000 portfolio. This would cost her $10,000 in total ($2/share x 5000 shares). Once you factor in this cost, then really the portfolio is insured to not fall below $490,000 because you would have to pay this $10,000 cost no matter what happened. For some people, this cost of insurance might be too high and they may want to find a way to reduce or eliminate it. If Sally were to turn around and SELL a call option (this means she is giving someone ELSE the right, but not the obligation, to buy her units) for a strike price of $110, she might get $1.50/share from the sale of that contract. This is what is known as writing a covered call. In this case, if she wrote (sold) 50 call option contracts with a strike price of $110/unit, she would receive $7,500 in premiums ($1.50/share x 5000 shares). This could be used to offset the purchase of the put options of $10,000 for a net cost to Sally of $2,500 versus $10,000. The trade-off is that she is now guaranteed no more than a 10% gain on her portfolio as the call option holder would exercise their right to buy Sally's shares once they reached over $110/unit. What is the end result? Sally is guaranteed to have between $497,500 and $547,500 by the time she retires. She has protected her portfolio from a loss of no more than 0.50%, but has limited herself to a maximum possible gain of 9.5%. It is possible to completely offset the bought put options' premiums with the sold call options' premiums if Sally were to lower the strike price on the call options she sells to perhaps $108. In this case she might command a higher premium of $2/share for selling the call options which would completely offset the cost of the put options. In this case her portfolio would be bound between $500,000 and $540,000 (guaranteed return between 0% and 8%). Again though, Sally is trading off even more upside potential for her portfolio. The simultaneous purchase of a put option with the sale of a covered call option is known as the Equity Collar. I mentioned that an Equity Collar can be implemented with individual stocks and in fact it can be implemented with any optionable security. For a perfect hedge, you would match the options to the underlying security. However, if you have a portfolio of 20 Canadian blue chip stocks, this is a lot of work for a perfect hedge. An imperfect hedge would use an option on a proxy of your portfolio – which in the case of a portfolio of 20 Canadian blue chip stocks would be options on the TSX/60 index. This would have a high enough degree of correlation to your portfolio that you could accomplish the same results, give or take 50-100 basis points perhaps, with only having to worry about 1 set of puts and calls. As always, consult with a qualified financial advisor before engaging in any investment strategies. Preet, another great guest post, thanks. Quick question, how do you plan around the option expiration date? Do you pick the furthest out date possible? Selling the call option long gets sally more money, as would buying the put long would cost more. The example was to show how to protect the stock doing a collar. Some familiar with optioning trading would sell the call long and buy puts short (pennies), month after month till the objective target is reached. Nice article and it’s an interesting strategy. However, I am not sure the price assumption is valid. Let’s say Sally does not want to lose any money. She buy her put option at $100/share, in order to offset the cost, she would have to sell call options. The question is whether she would be able to offset the cost even at $100/share (i.e. she is guaranteed to not lose money and not make money)? In a pessimistic market, I am not sure she could. Let’s try another example, let’s say the market is very good and Sally wants at least prime rate return on her portfolio. She would buy her put options at that price and sell her call options, say 1% above prime. If she could do it, she could then borrow money from the bank at prime rate and guarantee to make very high returns. Again, not very likely. In the end, Sally can only expand her collar from the share price that the market think it would be after a year. Are you suggesting sally not buy the stock but simply write option contracts doing anyone of say a strangle or straddle? What happens then with the time decay (depending how far out the contracts are) and what-if the stock swings like crazy, even drops or increases by 20, even 30% then what? Question on hedging is (assuming sally holds the stock), how does sally make decent money (even if she borrowed the money at prime) no matter which way the market goes. I think Preet was as close as it gets on hedging and making money with the covered collar appeared to be a guaranteed no-lose. But hey, if someone has a better solution, I’m willing to learn. The numbers in this article made the equity collar sound good. So I decided to look at some real CBOE Dec 2008 S&P 500 option prices (on SPY in the US). At the money puts cost 6.6% rather than 2% in this article’s example, and 10% over the money calls can be written for 2.6% rather 1.5%. This moves the guaranteed range to $480,000 to $530,000. This is a whole lot less attractive than the range $497,500 to $547,500 from this article. The point where the option prices offset gives only a 1% spread rather than an 8% spread. Are today’s option prices on SPY unusual? Perhaps the equity collar should only be used when option prices are favourable? Hi FT: There’s no hard and fast rule, but normally you would try to match your need with the term if possible. So in Sally’s case, I matched the length of the option contracts to her desired retirement date. Mr. A: You are quite right in that the pricing of options is subject to some of the same gyrations as the underlying security since options trade like stocks with bid/asks. I just looked up the prices for XIU options. The screen showed the current price of XIU as 84.93. The last trade price of buying a December 08 put on XIU for a strike price of 85 was $5.47. The last trade price of selling a December 08 call on XIU at 85 was $5.85. Therefore for free insurance on the stock (minus some trading costs which are low enough today with discount brokers that it won’t figure in significantly for this little example), will not cost you anything out of pocket (in fact you would net $0.38 per stock), but of course you are foregoing the opportunity cost of the market rising. But again, you are right – this does not always hold true and it may cost you out of pocket to protect the portfolio (if the income from the call didn’t cover the cost of the put). A number of factors will determine if pure loss protection is “free” (or costs you money), and if your goal is for free (or low cost) insurance the possible range of portfolio returns will be in part determined by the market’s outlook. So for example in Sally’s case we started with a range of -0.5 to 9.5, then moved to 0.0 to 8% by lowering the strike price of the calls. Depending on market conditions, perhaps the range could be 0.0% to 5%, or -1.0% to 6.0%, etc. It’s very much dynamic. Also, more importantly – this is not really something for a long term investor with a very distant requirement of money from the portfolio. Since markets tend to go up over very long periods of time, you would be better off just holding your positions and waiting for them to go up (or back up) without capping any annual gains. Michael James: In retrospect I should’ve used more “real world” numbers, as the example was more to show the structure of the Equity Collar. I’ve used some real number in the above comment thread to show that in current market conditions (for XIU anyways), the range for Sally would be very narrow for free “portfolio insurance”. And yes, the option pricing environment can change so the spread for a “free” collar can be more favourable. When markets are volatile, option prices generally increase since the chance of hitting the strike prices increases if the underlying security is expected to have big swings (up or down). I wanted to provide harder evidence for how changing market conditions affects the strategy. Given the recent volatility, options prices are generally higher, so I went back in time to find a less volatile time period so I picked March 1st, of 2007. I used a liquid single stock, and I arbitrarily picked POW (Power Financial). The exact day was chosen so that the price of the stock matched exactly a put option strike price that was readily available. On Mar 1 2007, POW was trading at $38.00. You could buy an October ’07 $38 put for $1.65. You could sell an October $40 call for $1.70. So in this case you are getting a net income on the options and your return range is between +0.13% and +5.39%. A $42 call and $44 call could be sold for $0.95 and $0.50 respectively. Buying a 38 put and selling a 42 call would give you a range of -1.8% to 8.7%. Buying a 38 put and selling a 44 call would give you a range of -3.0% and 12.7%. Note: In all cases, just because there is an upper range doesn’t mean you will get that return, it only denotes the maximum possible return you could be entitled to if the security actually did go up to that value (or beyond). You would have to hunt to get a range of 0-8% or -0.5 to 9.5% like in the example in the post – but it is possible, however the norm is for narrower spreads. One approch that I use on the long contract is selling a covered call in the money to offset the downslide (said that before) and used the example recently of GM at $20 and always making sure that I get a premium on the contract sold. Example: GM JAN 09 $10 call, paying $11 for the contract … a $1 premium over and above the contract strike price and $10 protection on the downside. Maybe pick up some dividend in between. It has been my experience that a stock that floats around its current price when you write the contract (sell the covered call) you are generally not called till close to the contract expiration date, at which time all being equal, the contract could be bought back at a fraction. Should the stock go down anywhere between $20 – $11 you’re totally covered. Another option with the $1 premium is to buy a put at say $15 or $10. Only pick up would be the dividend. Covered call contracts are not cast in stone, they can be bought and sold between the write date and expiry … several times in fact. Indeed, you made a good point. On SPY the most favourable of all stocks, or even the options themselves, but you need to watch the volatility and the options. Such great volume, movement in the stock is a buck or two each day, even just wrting a call or put at the money (ATM) could yield 5% – 10% per day, without looking at calendars, spreads butterflies or condors. Has anyone noticed the relationship between the ^VIX and SPY, they can be used in combination with any stocks that you hold to protect (hedge) the downside and make some money. Even WDAMMG is too long. Ah, the power of hindsight…. Instead of using calls and puts to reduce risk, Sally should be using dollar cost averaging on the way out of her portfolio. Instead of selling her entire holdings on retirment, she should be selling her ETFs and buying fixed income over a span of years before she reaches retirement. This minimize the impact of volatility in both selling her ETFs and buying her fixed income. Al, when a person is retired and assuming her holdings are not dividend baring. Since she has only 9-months to retirement and with $500k of equity capital that Preet has stated, my assumption was its already (40-years of savings) at a balanced cost averaging. Wow, that said Al, how does sally protect her life savings and hedge while getting a retirement income. I suppose what preet is trying to do for about to retire sally, is to maintain capital then take her to the next stage and provide a safe secure reasonable income on retirement. Its possible Al with what Preet said on the collar was to give an example and show one method to save (protect) her fortune. But my take is that also I would like to get sally some residual income as well as protect on the downslide. I think you missed what I was suggesting. She should dollar cost average while *selling* her ETFs by starting well before retirement (5 years +). She can buy dividend stocks or fixed income as she sells ETFs. This way she can reduce the effect of market volatility both on selling her ETFs and buying her fixed income/dividend investments. If Sally uses this collar technique, she may protect the value of her ETFs but it does nothing to protect her from paticularily low interest rates on fixed income when she is buying. For instance GICs are paying a measly 3-4.5% right now. Her only other option is to park her proceeds from the sale of the ETFs and wait for interest rates to improve. Al, I agreed with your original post, I think I covered it, but started to waffle a bit. One thing is “parking”, sometime just stting there you can get hit from the side or back while your sleeping. Have to be watchful of all of ones investments and to plan (hate that word) to look at every option or possibility that may take any equity down. This is a great strategy and I must say, you explained it very well! My Finance professor in grad school needs to read your blog….